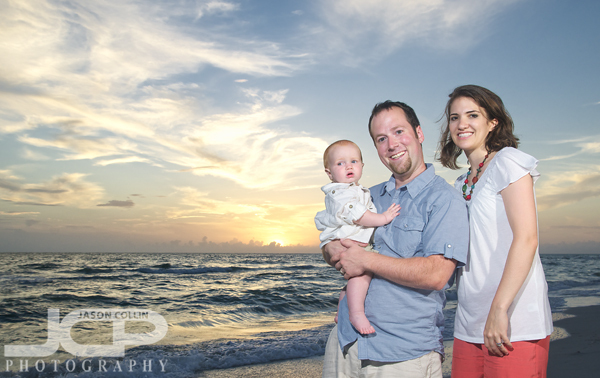 Young family and baby candid beach portrait on Treasure Island Sunset Beach St. Petersburg Florida - Nikon D300 Tamron 17-50mm @ f/8 ISO 200 1/100th - Strobist: SB-800 to frame left & SB-600 to frame rightI returned to Sunset Beach on Treasure Island in St. Petersburg Florida once again this time for a large group family beach portrait session. 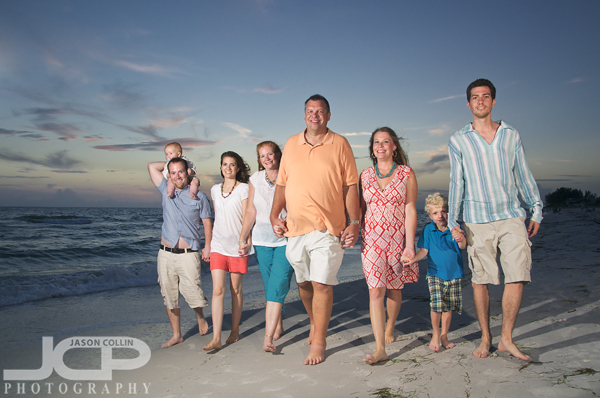 Normally I work with no shotlist on family beach portrait shoots, but due to there being six adults and two children composing three family groups and three generations I did ask the client to provide one to make sure we got all the pairings desired. The shot above features another new pose I have not done before. I asked the family if they were willing to get a bit crazy and they say yes for sure so with the will to lay down on the sand there, we were able to make this shot which was my favorite of the evening. Large group family beach portrait on Sunset Beach Treasure Island Florida - Nikon D300 Tamron 17-50mm @ f/8 ISO 200 1/160th - Strobist: SB-800 to left & SB-600 to rightThe key to reducing and even better eliminating shadows when making a large group family portrait on the beach is to have the family not stand in a concave line as seems to be everyone's natural instinct, but rather a convex or at least straight line so that the people for example in the far right of the above image do not cast a shadaw on the people next to them. I start by setting up a shot like this by having the person in the center be the anchor, and then placing everyone else around that person. Another vivid sunset on Treasure Island St. Petersburg Florida - Nikon D300 Tamron 17-50mm @ f/6.3 ISO 200 1/125th - Strobist: SB-800 to frame left & SB-600 to frame rightWhen working with essentially three different groups with the every present sunset as a countdown timer, the photographer has to work even more efficiently and try to provide as best as possible variety in the shots, but of course an entirely different image cannot be made for each group each time within a 60-minute session. 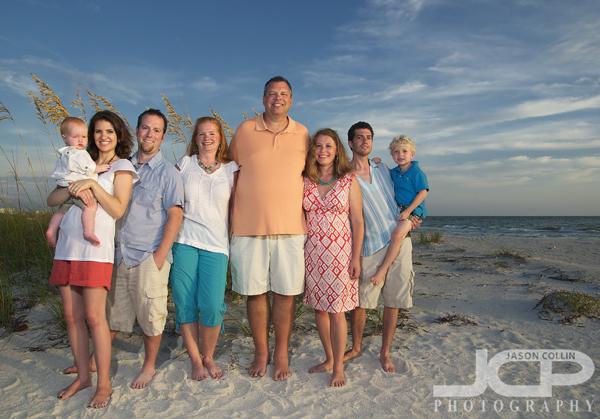 This was really my first time to work with this many pairings on a family beach portrait session and I was pleased with the variety of shots I was able to make, though as you can see there was only time to work with one camera and lens where I usually shoot with at least two and sometimes three lenses. Tall beach grass family portrait on Treasure Island Florida - Nikon D300 Tamron 17-50mm @ f/8 ISO 200 1/100th - Strobist: SB-800 to frame left & SB-600 to frame rightThis is the same grass location as her sister's family, but a different pose makes for a very different feel in the final image. I also shot from a different angle and a bit wider. Luckily, Sunset Beach's tall grass has survived well despite the recent tropical storm. Large group family beach portrait walking at dusk - Nikon D300 Tamron 17-50mm @ f/5.6 ISO 200 1/80th - Strobist: SB-800 in front & SB-600 to front rightThis semi-complex group walking shot was made on the first take which was great as you can see the sun was already below the horizon and light was fading fast. My advice for this type of shot is for everyone to start walking with the same foot forward, while holding hands and continuing to walk even after I take the shot to maintain a natural look to the image.